My husband loves this picture. He is a man who relishes hard work; his muscles give witness to this. while in real life it is a snowy April. 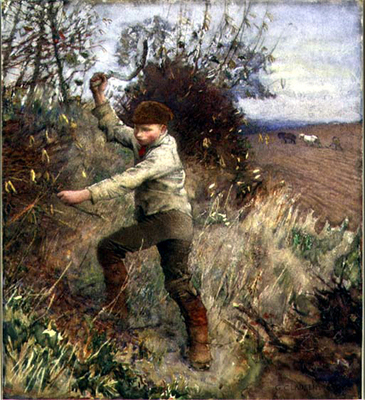 The watercolor above was done in 1885. This Mowers is an oil, done six years later. Which one do you prefer: the watercolor or the oil? In both, I think he’s captured the fluid movement of the mowers. This dun colored piece doesn’t have the elegant light of the ones above. The background seems too cluttered or busy. or even son of the men above. 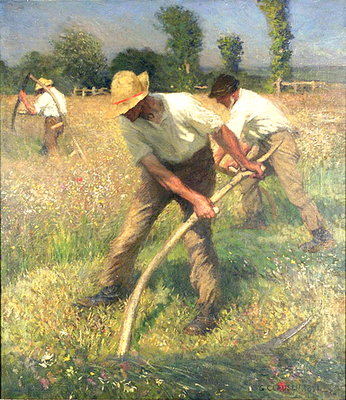 Boys at work. It just seems right. and the woman presiding over the table is his wife. Clausen is my find of the year (happy sigh). This entry was posted in Uncategorized and tagged clausen, fineartfriday, husbandlove by alivingpencil. Bookmark the permalink. Love the *work posters* – perhaps a crass name for lovely artwork. And Clausen does make back-breaking labor look truly beautiful. Did you email the blogger about the *missing* painting? 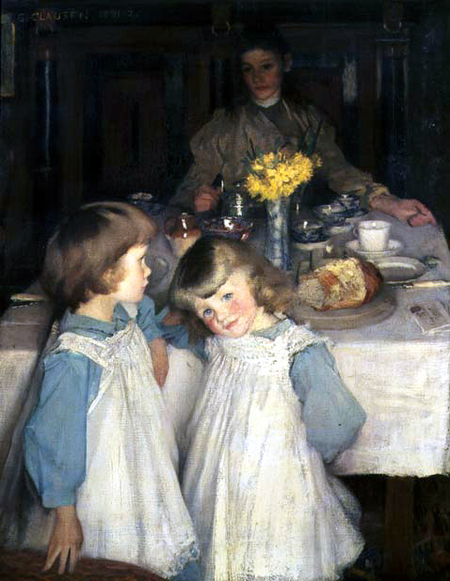 You know, the one with the girls praying?The breakfast table reminds me of a Sargent depicting a similar scene. These girls are cute… could be me and Noel :)If you have time, check out the discussion at Cindy’s. It’s about rearing/homeschooling sons.And how’s Isaiah? These paintings really captured my son’s attention! 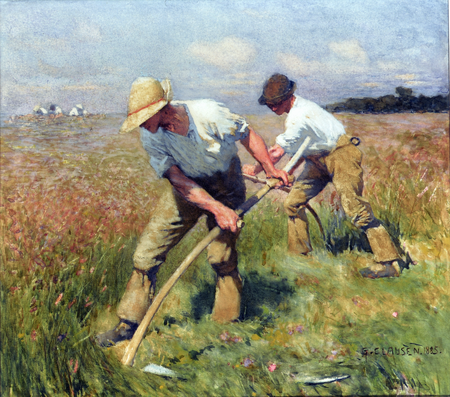 The motion of the blade, the differences in location, the different tools the men and boy are using.I like the brighter colors of the water color; but somehow in the oil, he captures a wonderful sense of wind – in the grass, the whipping pant legs, the trees bowing in the distance, the clouds, even the men themselves all point in the same direction. I like the watercolor best–it really looks very impressionist, don’t you think? And the little girls–oh, the memories this brings back! Dressing my girls in very similar outfits on Easter and Christmas–sigh…I have photos of my Chrissie in an almost identical outfit, where I took her to JC Penney’s at the age of 2. She won 2nd place in the “beautiful blue eyes” contest, her hair in curls and matching frilly bows. I’ll have to find it and show you sometimes. After reviewing the link, I would have guessed you for highlighting the *Twilight* painting in which the girl is reading with a small lamp.I like the Boy Trimming the Hedge painting…. ’cause I like *browns*. @hiddenart – I’m saving that for next week! (giggle) I just can’t stay ahead of you, can I? Ooops! Sorry, Carol. I didnt mean to rush you and furthermore, I think it is very admirable to think ahead like that. Actually with all you have going on with the accident and weekend company, I’m just glad for a glimpse into the workings of your mind.BTW I ordered Liberal Fascism….. better way of perusing to see if it is suitable for book club material.